Samsung introduces its own dual camera concept. Could this go in the Note 8? So, for a while now, we've been hearing that the upcoming Galaxy Note 8 might have a dual camera sensor — a trend that has been entering the mainstream more and more. And while it's not entirely certain that Sammy's top-tier phablet will have the feature, it's quite possible that the company will dabble in the concept in the near future — either with the next Galaxy S flagships or with a special spinoff phone to test audience reaction. In any case, one question remains — what type of dual camera would it be? Right now, manufacturers do the dual cam thing in three different ways. Apple's iPhones put a telephoto lens on the secondary sensor, providing a 2x optical zoom and more “honest” imaging for portrait shots; LG's solution is to have a super wide angle lens on the secondary camera, allowing the user to get more stuff into the frame; Huawei's method, which is also very popular among lesser-known brands who want to have a dual camera on their phone, is to have one RGB sensor to take photos with and one assistive monochrome sensor to better collect lighting and depth data. 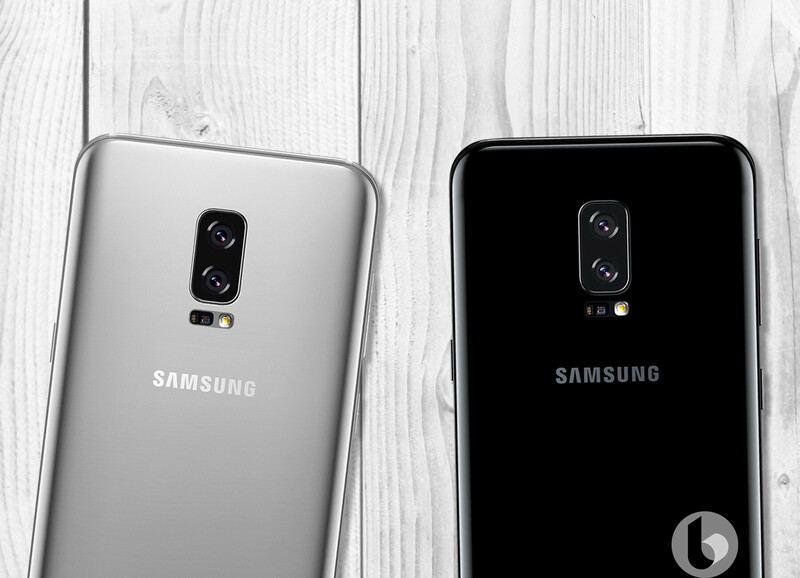 So, if Samsung were to make a dual camera for an upcoming phone, which type would it be? 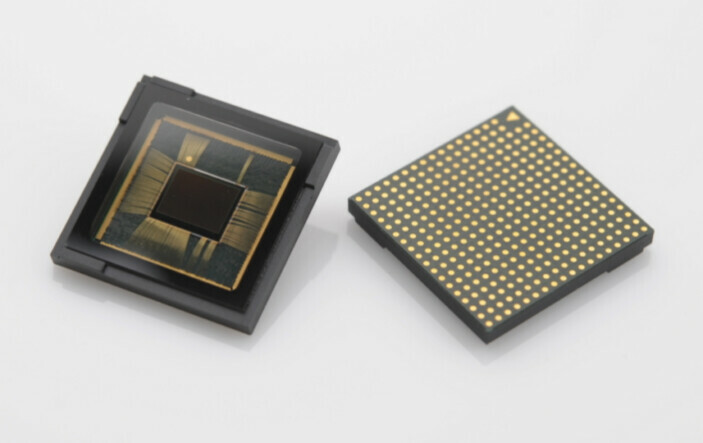 At the 2017 MWC in Shanghai, which is currently ongoing, the smartphone-slinging giant presented a new sub-brand under its ISOCELL camera sensors. 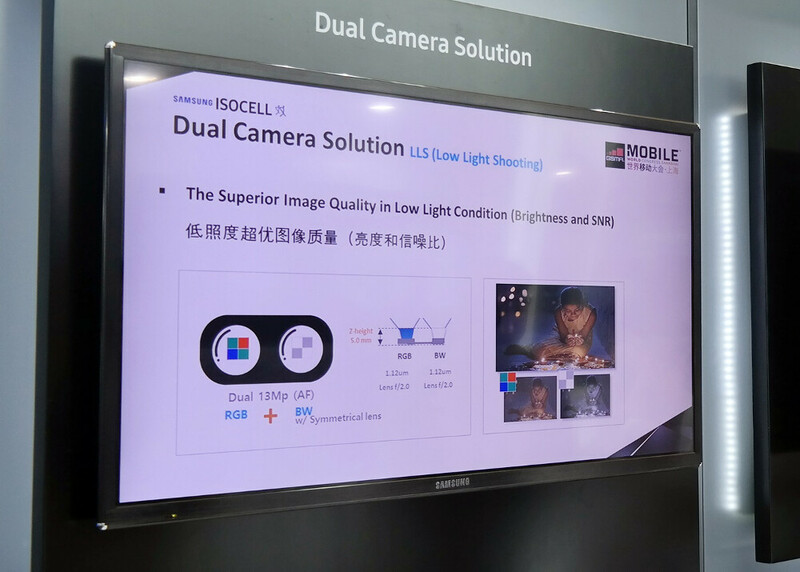 The new kid on the block is ISOCELL Dual and it's used to describe a technology in which Samsung employs two of its camera sensors in order to produce high-quality photos. The ISOCELL Dual concept is shown in a single slide, where we can get some details about it. Much like Huawei's solution, Samsung uses an RGB sensor and a black-and-white sensor that play off of each other. What's a bit of a disappointment is that the example device shown on the board has a lens aperture of F2.0 — definitely smaller than the F1.7 found on last year's Note 7 or this year's Galaxy S8 —, and the sensors' pixels are 1.12 μm small — again, much smaller than the 1.4 μm pixels that are on Sammy's latest and greatest sensors. So, what does this mean? Smaller pixels usually speak of poor light-collecting capabilities, but one could argue that the monochrome sensor might somehow magically offset this disadvantage. But the smaller aperture would definitely be a step back — it is not only worse at light gathering, it would also introduce a longer depth of field and reduce the phone's natural "bokeh" capabilities, which is something we believe is a generally sought-after effect. To be exact, we don't believe that this particular concept, which we see at the MWC 2017 Shanghai slide, is the dual camera that would go inside the Galaxy Note 8. It might be a presentation of a dual cam setup, which Samsung would sell to its partners, or one that would go in a lower-tier Galaxy phone. But compared to Sammy's current cameras, what we see here just looks like too much of a downgrade for the sake of having two cameras on one's phone. At least on paper... However, it is quite possible that the Note 8 or the next Galaxy S flagships could use this ISOCELL concept, just with better sensors and lenses. Time will tell and August is near! Finally, there will be dual camera that will make sense. I am really interested to know on which side are you at, coz, you are bashing both Apple and Sammy. You must be a smart phone critic as I am. I like your profile - check out mine as well - Phones section. *facepalm* As an image sensor manufacturer, Samsung offers a pair of stock sensors designed to be used in certain kind of dual camera modules to OEMs. What to do with them is completely up to the manufacturers. They can implement it with different aperture and lenses. They can even build a dual camera module with an ISOCELL Brite and an ISOCELL Slim sensors to do Apple like dual camera setup. Or they can build a setup similar to LG's with 2 ISOCELL Brite sensor. Any manufacturer including Samsung itself can order custom sensors if they can afford it. The so-called "zoom" capability is one of my reasons why I'm stick with my their V series. It's a nice, niche features that really delivers. Note 8, now with upgraded explosion and flying shrapnel.